The White House has asked Big Brothers Big Sisters to be a part of the Take Our Daughters and Sons to Work Day initiative on April 28, 2016! Each year, more than 3.5 million American workplaces open their doors to over 37 million employees and their children on this special day. We are honored to be asked to be part of something so purposeful and worthwhile in South Texas. This year, President Obama and First Lady Michelle Obama are focused on ensuring that all youth, regardless of whether they have a parent who can take them to their workplace, have an opportunity to experience the working world. You can view this video of the President last year expressing his support for Take Our Daughters and Sons to Work Day and the organizations partnering to make it successful. Locally, Big Brothers Big Sisters is encouraging all mentors across the city to invite their students to come to work with them on April 28. Additionally, we would love for them to take handheld pictures and videos of their experiences for us to post on our social media. 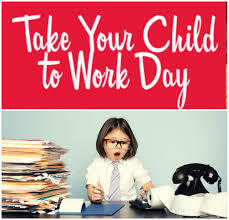 To help prepare all mentors for a successful day at work with their students, the Take Our Daughters and Sons to Work Day organization has prepared a Toolkit with everything a mentor needs to know as they prepare to share this experience with their student.